Home / Scottish Brick and Tile Industry / Phippsfield Tile and Brick Works, Black Isle, Near Tain. Phippsfield Tile and Brick Works, Black Isle, Near Tain. 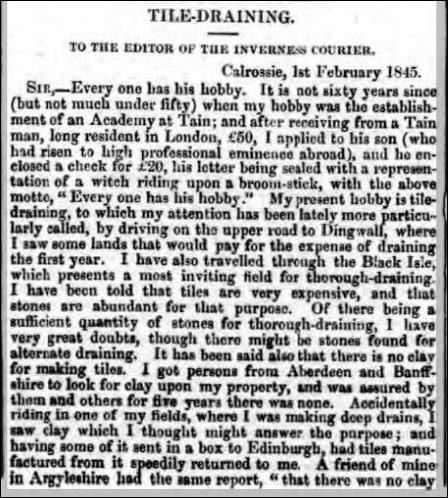 Below – 10/06/1840 – Inverness Courier – Advert. 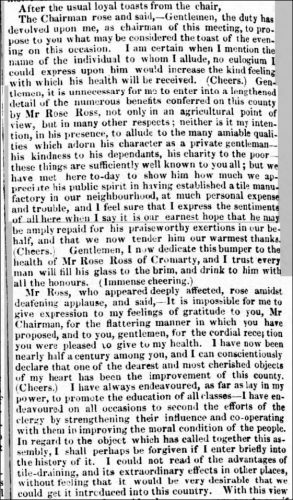 Below – 08/07/1840 – Inverness Courier – Public dinner in Tain to Hugh Ross Esq, of Cromarty. 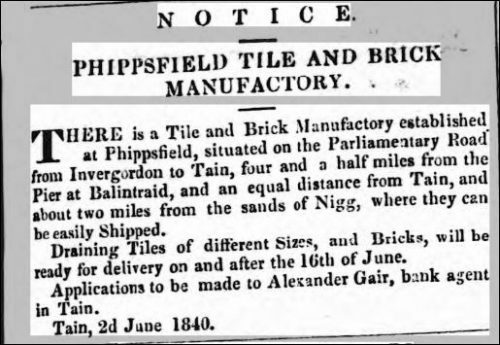 The special object of the dinner was intended to celebrate the establishment by Mr Ross, Phippsfield of a manufactory for bricks and drain tiles which is now in full operation. 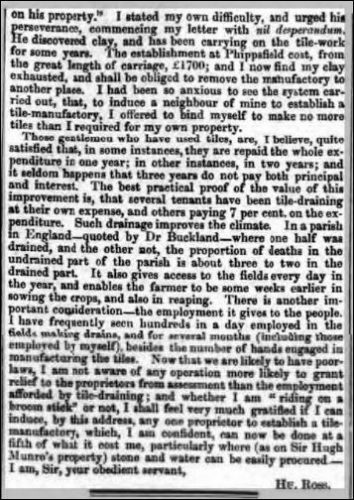 Below – 07/04/1841 – Phippsfield now in full operation. Mr Chisholm is the manager at Phippsfield by Parkhill. 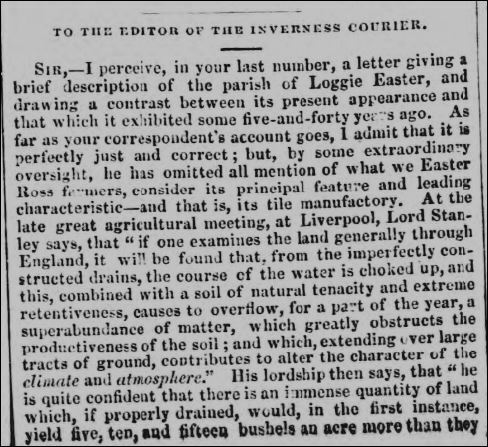 12/10/1843 – Perthshire Courier – Farms to let. Arabella and Glatstullich. Upon the farm of Glatstullich there is a superior tile manufactory in full operation and equally convenient for either of the farms. A considerable portion of both farms are already tile drained. The proprietor will be in every way disposed to encourage improvement either by tile draining or otherwise. Proprietor Hugh Ross Esq of Cromarty, Calrossie. 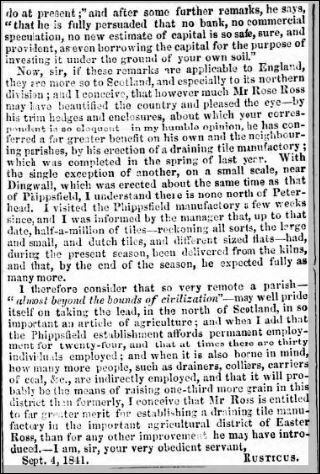 Below – 05/02/1845 – Inverness Courier – Letter from Mr Hugh Ross, Calrossie regarding his Phippsfield tile works and his thoughts on the value of field drainage. 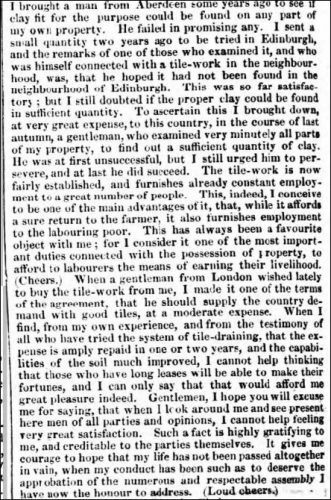 27/08/1845 – Aberdeen Press and Journal – Arabella Farm for let. Upon the farm there is a superior tile manufactory in full operation which if desired would be let along with the farm. A considerable portion of Arabella and Glastullich is already tile drained. 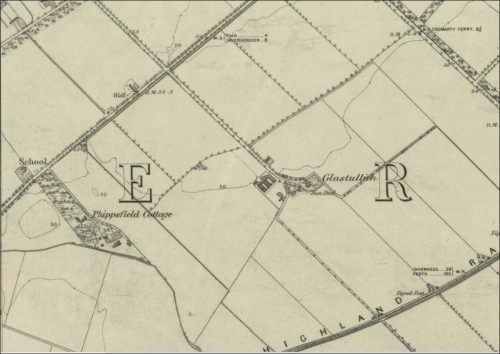 03/03/1847 – Perthshire Courier – Arabella Farm for let. Upon the farm there is a superior tile manufactory in full operation which if desired would be let along with the farm. A considerable portion of Arabella and Glastullich is already tile drained. 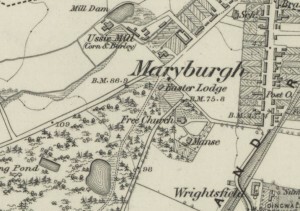 Below – 1872 – The Phippsfield brick and tile works were situated somewhere in this region. 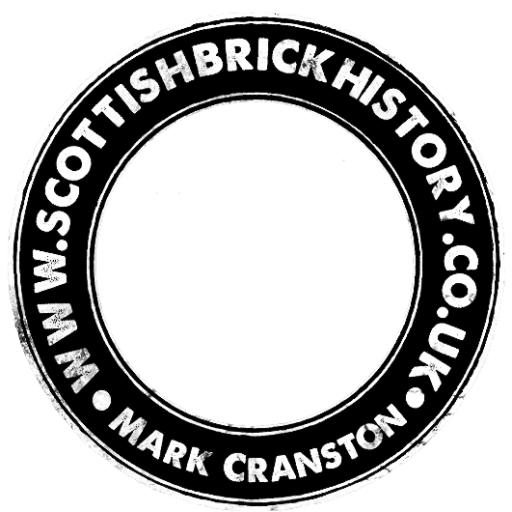 Next Article Knightswood Brickworks, Knightswood, Glasgow.